Two international mysteries in one! Set in a sleepy town in England, these books take you into the mind of a renowned Inspector and take you on a journey to catch a killer. 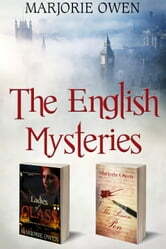 Richard Hayward’s promotion and move from the big city life to the sleepy town of Burshill, England, has been shattered. Sir John Bury needs a murder solved. The results of Richard’s investigation cause a ruckus when several ladies of a particular ‘class’ become part of the inquiry. As the facts begin to unfold, they not only amaze Richard, himself, and the community of Burshill, but extend all the way to the top brass of Scotland Yard. Detective Chief Inspector Richard Hayward had just started his vacation with his pregnant wife when the call came. Another murder had interrupted the town's peaceful existence, and the murderer won't stop at just one victim. Richard will need all of his expertise if he's going to find the killer lurking among the town's only department store. But when the Chief Inspector gets too close to the truth, his ongoing search places his wife and the life of his unborn child in jeopardy. It's a killer's warning. Back off or pay the consequences. Never one to back down, Richard must find the murderer before more lives are taken, but most importantly, he will do whatever it takes to protect his family.